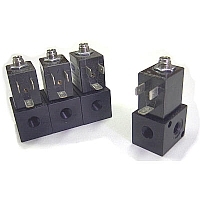 Miniature 53 Style Modular Manifold Square Body Valves by Fabco-Air are time proven, space saving, reliable 2-way, 3-way, and 4-way solenoid valves with 10-32 UNF or ⅛" NPT ports are available in singular or modular manifold versions. Any combination of function and ports can be combined in the same manifold stack to save time, space and plumbing. With pressure manifold plugging, two or more pressure ranges and/or medias can be controlled in the same stack.